A Kansas-based manufacturer of concrete maintenance and building envelope products has released a new product in its line of flashing materials for residential and commercial applications. 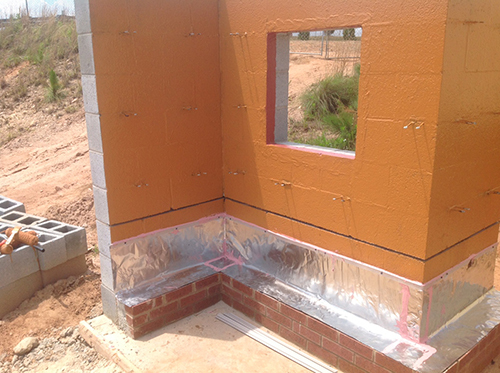 Designed for use with cavity wall and masonry veneer construction, the material can be used to complement conventional waterproofing and air barrier components, or as part of a building-wide R-Guard air barrier system, according to PROSOCO. The stainless steel fabric is compatible with other R-Guard building envelope products, according to the manufacturer. The thin-mil stainless steel flashing is made of 60 percent recycled material and is even recyclable itself, the company adds. The product doesn’t stain, making it appropriate for use with limestone, and it offers superior puncture resistance and tensile strength, PROSOCO says. Available in rolls of 12-inch, 18-inch, 24-inch and 36-inch widths by 60 lineal feet, the product is flexible and easy to cut and form by hand. Fire- and mold-resistant, SS ThruWall does not degrade in high-heat applications, the company says. For customers in coastal climates, the company offers a version of SS ThruWall with better chemical resistance to salt air in order to resist corrosion and other weather-related staining. Interesting idea. Picture doesn't show it actually coming 'thru' the wall, but stopping just shy of the face brick edge. What's to keep water from siphoning back on the underside of the flashing? If it was to be actually brought through the brick joint, how will it be neatly trimmed/ cut off? Charles - if you look closely it appears there has been a liberal application of caulk or other sealant along the top edge, along the fold, next to the exterior corner on both sides, two squares of caulk on the flat, etc.